It's time to grab your bucket and spade - we're off to the beach! No British seaside holiday would be complete without splashing about in a rock pool, searching out sea-creatures. Inspired by a blissful trip to Cornwall and childhood adventures, our new Rock Pool jewellery is set to become your must-have accessory for the new season. Fancy a peek inside our Kent studio? 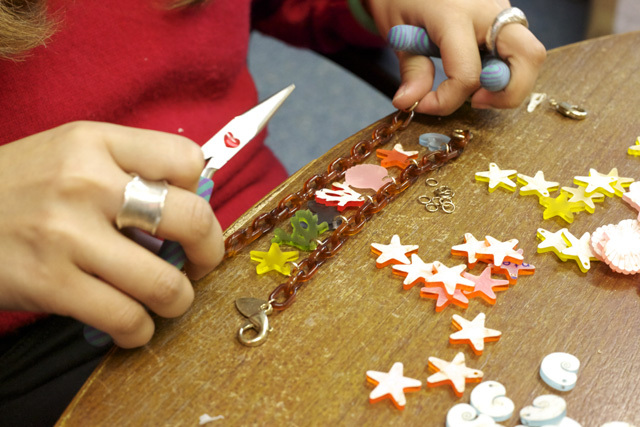 Our resident photographer Caroline shared these snaps of our talented team hard at work making the Rock Pool Charm Bracelet. 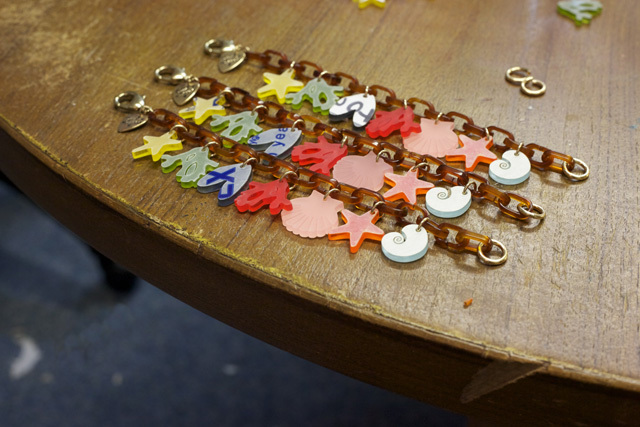 Each dainty shell, mussel and seaweed charm is laser cut from our cute new pastel Perspex. We love the frosted finish - it reminds Harriet of weathered pieces of sea glass that wash up on the shore... Steady hands! 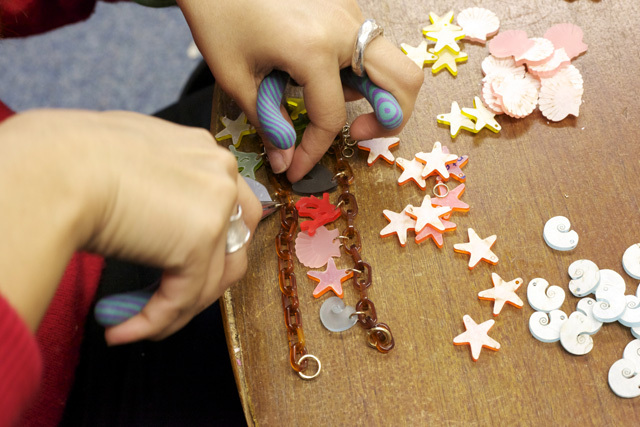 Ayesha gets to grips with miniature starfish in translucent orange and yellow Perspex. She'll be adding these cute little creatures to the chunky tortoiseshell chain by golden links: Ta-da! Adorable Rock Pool Charm Bracelets ready to head online and into our Brick Lane and Covent Garden stores: Falling for the Rock Pool Necklace? Here's a sneak peek at it mid-transformation! 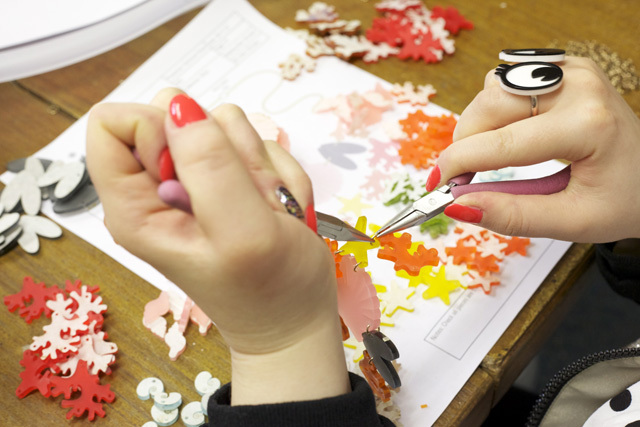 Each precious piece is carefully hand joined to the next with careful reference to Harriet's instructions: (Loving the Cartoon Eye Rings!) 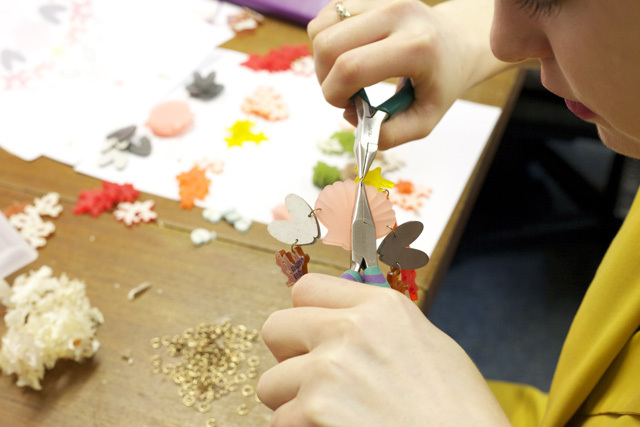 It takes a lot of skill to make sure the individual pieces sit properly and our jewellery makers are the girls for the job! Just look at that concentration... There you have it! Roll up your trouser legs and explore the Rock Pool jewellery now.